We don't recommend running an old version of DAZ Studio, after all the newest version, aside from new features, also has bug fixes for the older versions. You should not install two versions of DS 4+ on the same computer, unless one is Release and one is the Public Beta as they cause conflicts with each other and become unstable. Thank you, and yes, I know 4.7 brings bug fixes, and actually I rather like some of the new features (IPS, and "unlocked" dials). The reason I wanted to go back to 4.6 is because (on the other hand), I hate the GUI changes (floating viewport, font and look of the parameters tabs, and the new render settings panel). So I was wondering if the 4.6 installer would notice the 4.7 installation, and ask to uninstall, like it usually does for previous builds (to replace 4.7 with 4.6, not to run both together). You should be able to change the GUI back to the style of tabs and fonts you liked prior to 4.7. I had changed mine off the default, so it didn't change my GUI. Just change the layout to your preferred one. In the one I use, the viewport isn't floating either. Haven't played with the render settings yet. Well, it's strange, because at first, my viewport wasn't floating either, and after loading an old scene, it did turn floating, I didn't find where to change its settings back. But I'll try to play with layout settings tomorrow, thank you for the information (I really thought floating viewport was "mandatory" in this version, so hearing that we can change it is really good news). I'm not sure if this is a bug or a deliberate time-saving feature of IPR. It appears that when it calculates SSS, it does it for what is currently in the viewport only, and it keeps that calculation on redraws even if the camera moves to show areas of the same object that were not visible previously, resulting in areas being drawn that lack SSS and so appear "shadowed" when they aren't. I can force it to recalculate by changing something with the figure that has SSS (reposing it, changing a morph dial, possibly other things I haven't discovered.) Then the IPR pauses a moment longer, recalculating, and re-renders correctly. I don't mind this, if it's purposeful, and can work around it when it comes up, but it took me a moment to figure out what was happening because I thought there was a problem with my light. In below, the hand and hip were initially not in frame and appear like this when i moved the camera down and zoomed in (you can see SSS striping too since relative scale changed). I adjusted a morph dial to get it to render correctly the second time. Well, this says it all. Used the DIM to install. Or TRY to install. "Just use the DIM to install it." Well, this is stupid (sorry about my mood. You have to understand it took me months to get one version to work right.) I clicked off that message that said it encountered an error and had to close, and it blinked and the studio was there. Explain THAT though. I had a problem with the 'dockable' tabs earlier, I had a window suddenly snap above the user interface, the tabs X button was cut off by the top of the screen. Right clicking anywhere on the visible tab wouldn't allow me to close it, and I couldn't get the top back in view. The only way I could find to fix it (other than close DS) was to drop my screen resolution temporarily to access it and close it. I say 'snapped' because I moved it near the top, but suddenly it jolted and was cut off. Wish I took a screen shot. It's a limitation of how SSS is implemented in DS. It can be seen on earlier builds as well. Try rendering a figure with some of the limbs off camera but still visible to a surface with reflections to see the same problem. So it's not limited to just IPR. Raytraced SSS should be able to solve this problem, but shaders will have to be rewritten to take advantage of it. Did you have DS open when you installed? Well, it's strange, because at first, my viewport wasn't floating either, and after loading an old scene, it did turn floating, I didn't find where to change its settings back. But I'll try to play with layout settings tomorrow, thank you for the information (I really thought floating viewport was "mandatory" in this version, so hearing that we can change it is really good news). It is not mandatory, in fact it is docked, by default, to the center section. If, somehow, it becomes undocked you can just dock it again. We turned it into a pane for a couple reasons. First to give you a place to put the big panes, like Shader Mixer, which appears to get used more often by long time users, and second because creating the IPR pane (Which is just an additional viewport as far as the software is concerned) required the ability to put a viewport into a pane instead of just sitting there.) And third it allows some additional flexibility for those with 4K or dual monitors. It is indeed a limitation of the precalculation of SSS for the shader. Apart from making a geometry change, (Pose, morph, etc.) which forces a restart of the IPR calculation, stopping and restarting IPR will also force a recalculation, and should be easier to do. Did you have DS open when you installed?That was my first thought as well. It is not mandatory, in fact it is docked, by default, to the center section. If, somehow, it becomes undocked you can just dock it again. I've just finished my tweaks on the layout 20 minutes ago, and yes, I've got almost everything back to normal (docked main viewport, etc). Undocking it might be handy on 4k screens for sure, but on 1920 screens, it's not very handy, as it has to be moved each time you want to access the "scene" tab on the left. But anyway, I'll keep 4.7 :) , I've just had to change a few things (put the "content" tab back on the left panel, instead of right panel where I had it before, mostly), and the colors on the parameters dials can be edited. I've only one small gripe left, if I can say, parameters dials values that move at the center of column when you manually edit it with keyboard, I find it really annoying (the fact that it moves), not sure if it is just me ? In 4.6, the numbers didn't "move" when edited with keyboard. I didn't find any way to tweaks the fonts, not yet at least. I've only one small gripe left, if I can say, parameters dials values that move at the center of column when you manually edit it with keyboard, I find it really annoying (the fact that it moves), not sure if it is just me ? In 4.6, the numbers didn't "move" when edited with keyboard. That helped make the location of the edit "stickier." In 4.6 and earlier if you click a number and start to edit, the mouse pointer tended to get in the way, so you couldn't see it, and if you moved the mouse out of the way, the field lost focus so you couldn't type in a number. The shift to center, and the behind the scenes work, removed both of those issues. Oh, and one change that I would love in a future build : The possibility to change hidden settings text color (currently greyed), as it's rather hard to read when there are a lot of dials, since it's used a lot when importing stuff from other figures (V4 hairs, etc), and/or to tweak auto-follow adjustments. I put a screen capture, so you can see what I mean : Please file a support ticket with this as a feature request so we can add it to the list of requests. I will point out that just because you file a feature request, that does not guarantee it will be implemented, nor a time frame for implementation, but it will be considered. That helped make the location of the edit "stickier." In 4.6 and earlier if you click a number and start to edit, the mouse pointer tended to get in the way, so you couldn't see it, and if you moved the mouse out of the way, the field lost focus so you couldn't type in a number. The shift to center, and the behind the scenes work, removed both of those issues. And thank you, I'll send the greyed text request as a support ticket then. Are we talking about the font size setting in Windows' Control Panel:Display? 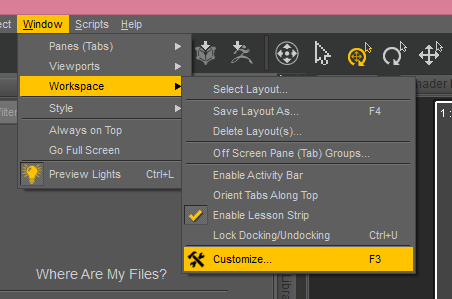 Because I've never seen that have any discernable effect on the font sizes I really want to increase in Studio. Studio's smallest text is at the lowermost limit of tolerability on my monitors; and the barely tolerable is not to be confused with the good. Most 3D apps are a blasted nuisance this way -- everyone programming the interfaces seems to think we all have 23-year-old eyes. It's the reason I wasn't even tempted to buy Zbrush, after I installed a demo once. I evicted it in half an hour because I didn't need the (literal) headaches. Studio's better than Painter, with the latter's Flash blurs. But I'd still work much more comfortably if I could increase the interface text size. Those are, currently, the only way to do it. With additional monitor sizes becoming the norm, it is something we are looking at, as the changing font size in the OS is definitely not ideal. Unfortunately it is not a simple change, so is going to take significant work. Really liking the new update to DS. Tried out the different layouts and City Limits lite gave me some great ideas for my own modified City Limits layout. Anyways I noticed some bugs and peculiarities that I wish i wrote down at the time but I am sure I will run into them again. One thing that does come to mind is when you favorite a hidden property or you change it's setting to "Unhide". It returns to hidden state when you set it back to it's default values. For example: in the Render settings pane if you "show hidden properties", then one option under the General section is "Render Style". 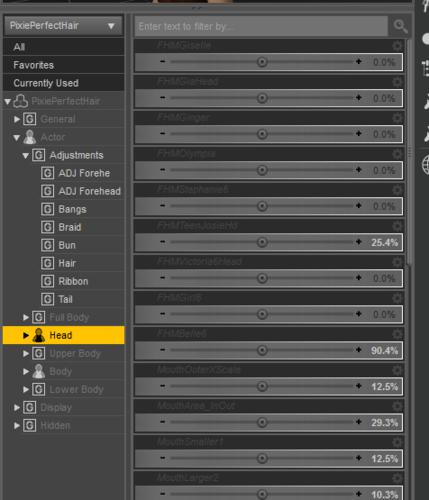 Which I use to add some nice thick shadows through layering in Photoshop. Anyways, you guys set this as a "hidden property", so once I have it available to me I will both change its setting (gear icon) to "unhide" and then "Favorite" the property. Now, I should be able to go and turn off "show hidden properties" again with no problems. But once I am done with my cartoon render, if I then re-set the Render Style back to "default" it then disappears from both the General and Favorites section. Lastly, the aux view port was a stroke of genius! However, I would love to be able to set my own default view port and aux view port settings. For example I have it set to auto-generate a default camera on New Scene. When I generate a new scene, the main view port takes on "default camera" view and the aux one does as well, so now when I use the object cube to move around the scene, I am actually moving the camera, instead of in perspective view. I just think it would be better if we could set the default views for both view ports on new scene. Also, it becomes annoying to see this aux view port mimic your movements out of the corner of your eye. All in all, you made some great updates to the software and I am quite impressed! Many thanks. Ahah - thank you oh thank you!!!! :)Push the button in the interface. That way it is easier to take advantage of the new feature. This is precisely why the button is there. It looks like a keyboard with the WASD keys highlighted. That toggles the keyboard navigation on or off. I don't understand favorites. I know it is not new to this release, but I haven't figured out how to make use of it. I can click on the heart to make something a favorite, but it doesn't stick. 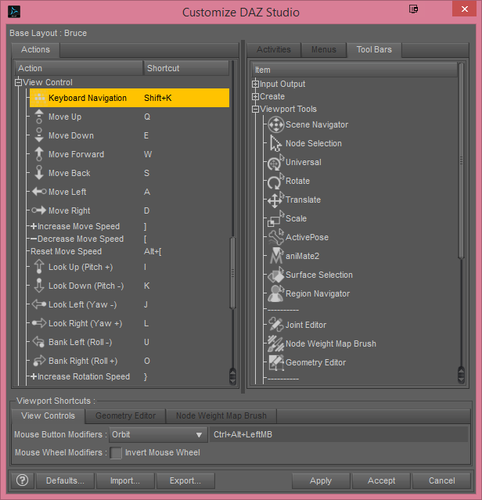 The next time I open DAZ Studio, the favorite is no longer a favorite. Do I have to save it in some way? Push the button in the interface. That way it is easier to take advantage of the new feature. This is precisely why the button is there. It looks like a keyboard with the WASD keys highlighted. That toggles the keyboard navigation on or off. It is under View Control, you can just drag and drop it into the tool bar of your choice, where you want it. Downloaded and installed the new Studio and loaded in a scene, clicked on Render and Studio ran fine up until the render window opened and it crashed. 'Studio not responding' for half an hour or so so I had to shut it down. I tried it another couple of times. Set the render settings to default still the same. Loaded in Genesis on her own and it still locked up. Rolled back the laptop to before the installation and 4.6 is still working fine with the scene. I have a log file, which is quite long, and if I am reading it right it is stopping at a different spot each time and there is nothing obvious standing out. If you give me an email address I will send it to you. Had a feeling that might be the case. Thanks for the tip about stopping and restarting IPR, yes that is definitely the easier thing to do. I had right clicking stop working in my scene then came back. Also unlike the past few versions of DS the lag to find content in tree view lags once again. 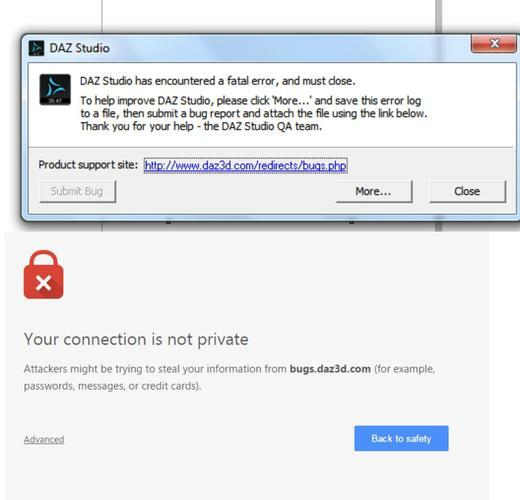 Rather than email, you will want to submit a bug report through https://helpdaz.zendesk.com/requests/new to tech support, you can add the log file as an attachment to this report. Make sure to provide exact instructions on how to reproduce the error so they can follow your steps and try it themselves.